The Irish Water Spaniel was developed to retrieve, bringing back dead or wounded waterfowl from the cold waters of Ireland. This makes the term ‘spaniel’ highly unfitting, as spaniels are flushing dogs. The exact ancestry of the Irish Water Spaniel is unknown, but remains that match this type of dog have been found dating back to the 7th and 8th centuries. Their mostly likely ancestors are the Barbet (the ancestor to the Poodle ) and the extinct English Water Spaniel. By the 1850s there were two separate lines that had developed. The Northern one had a white and liver coat which was very curly, short ears and little feathering. In contrast the Southern one (sometimes known as the Shannon Spaniel, after the river Shannon) had a pure liver coat with short crisp curls, long feathered ears, and a tail lacking curls. It is from the Southern dogs that today’s breed developed, aided by Justin McCarthy, who has often been recognized as the founding father of the breed. He was largely responsible for the early breeding and fixing the type. 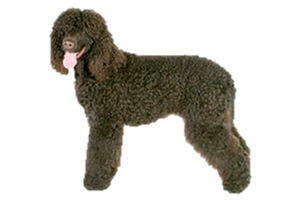 Is the Irish Water Spaniel Right for You?